Rangelands in Uzbekistan are one of the most important life-supporting natural ecosystems. Photo by Sanobar Khudoybergenova. Rural households in Uzbekistan customarily invest into livestock as a secure way of savings. Surroundings of settlements and accessible watering points are normally used as grazing areas. However, unsystematic and excessive load on rangelands has led to strong processes of land degradation and put pressure on rangeland resources. Rangelands in Uzbekistan are one of the most important life-supporting natural ecosystems. They occupy about half the country, nearly 25 million hectares, the bulk of which is located in the north – large parts of Karakalpakstan, Navoi and Bukhara regions, as well as south - Kashkadarya region. 80% of rangelands are located in deserts, with average annual precipitation of 100 mm, mainly used for karakul sheep, camel and goat breeding. Karakul sheep, the most well-suited for desert rangelands, make up about 4.5 to 5 million heads, mainly bred by 'shirkats' (collective farms) and households. 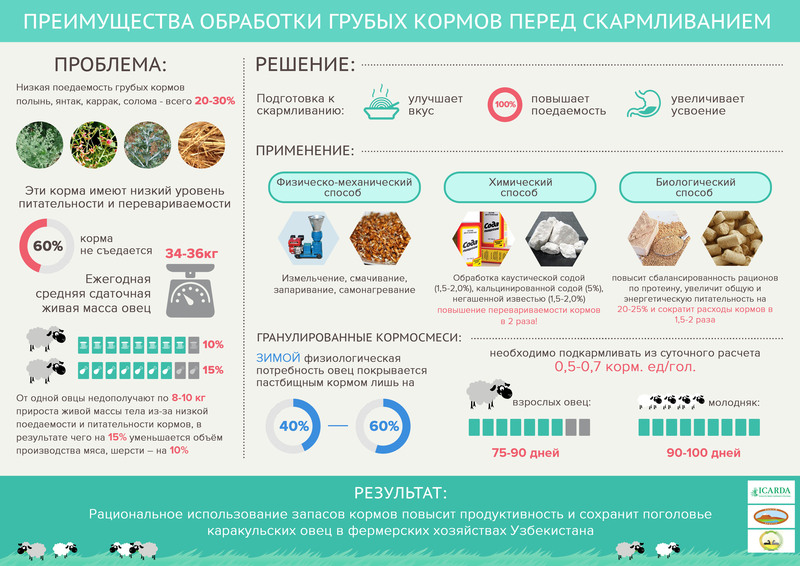 Like the entire region of Central Asia, Uzbekistan’s livestock production faces a number of challenges, despite support from the government and attention paid to improving production of livestock. Constraining factors are mainly limited resources of pasture and arable land for fodder production, whose state is further exacerbated by erratic rainfall and increasing summer temperatures in recent years. Increased demand for meat products due to population growth and income of urban residents indicate the need to consider a more environmentally conservationist approach for feed and livestock systems. To address challenges like climate change and land degradation, ICARDA-led Knowledge Management in CACILM II project organized a round table on 18 March 2016, wherein rangelands experts, officials, members of parliament, farmers and local populations attended to discuss the state and prospects of rangelands development in Uzbekistan. As stated by experts, about 40% of desert pastures are degraded in varying degrees and rates of degradation appear to be increasing. The concentration of large numbers of livestock causes shortage of green-fodder in foothill areas due to excessive grazing. Currently, over 3 million hectares of rangelands are subject to medium and 1 million hectares are subject to strong degrees of degradation. Excessive use of land for grazing around settlements, lack of watering points for livestock in remote pastures, abandoned and poorly maintained water-wells, lack of transportation and roads to remote pastures, and mismanagement of pastures leads to the loss of forage capacity and disruption of natural regeneration of pasture productivity. One of the disturbing outcomes of rangeland degradation is the growing level of contamination with poisonous and inedible weeds. They may cause poisoning of varying severities including death of animals. According to current legislation, most pastures are considered as land designated for agriculture, thus, issues related to pastures are regulated by the Land Code, which provides only limited measures such as obligations for improvement of their condition and compensation in the event of improper use. Farmers that attended the roundtable, for example, the household owners in Farish district of Jizzakh region, believe that joint work is necessary to develop and adopt a practical law on rangelands, raising awareness of residents about the necessity for sustainable use of natural resources, and economy of livestock. The reflections on the round table held by the CACILM II project have been submitted to the Center for Support of Entrepreneurship and Farming of Uzbekistan for further consideration. The center is a non-governmental, non-profit organization that works in cooperation with governmental bodies and regional authorities and assists farmers in improving sustainability of agriculture and agro-industry. Dr. Akmal Akramkhanov, CACILM II Project Coordinator, highlighted the importance of addressing legal issues related to improving the efficiency of pasture use, and formulating steps on further facilitation at the government level. The Knowledge Management project in CACILM Phase II, implemented by the International Center for Agricultural Research in the Dry Areas (ICARDA) and supported by the International Fund for Agricultural Development (IFAD) since February 2013, aims to establish a knowledge platform to consolidate knowledge generated within Phase I of CACILM and to outscale sustainable land management approaches and technologies in five participating countries: Kazakhstan, Kyrgyzstan, Tajikistan, Turkmenistan and Uzbekistan. 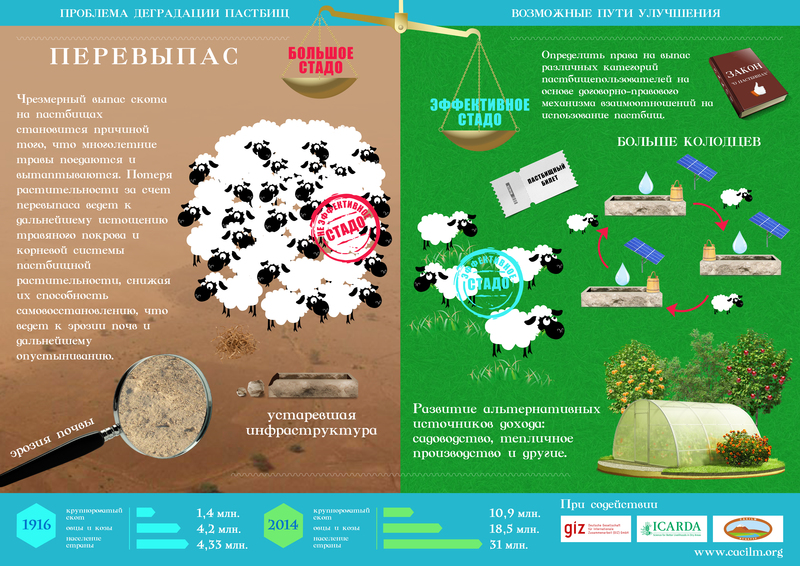 The project has prepared and disseminated among stakeholders several recommendations on sustainable use of semi desert rangelands in foothills, desert pasture livestock and feed resources, and infographics on the processing of coarse forage before feeding and pasture degradation, and a video on sustainable management of rangelands.